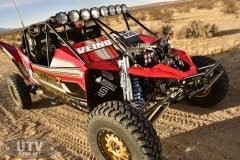 With UTVs representing the fastest-growing segment of offroad racing, it’s quite common to come across spec-built race machines in the deserts of Southern California. 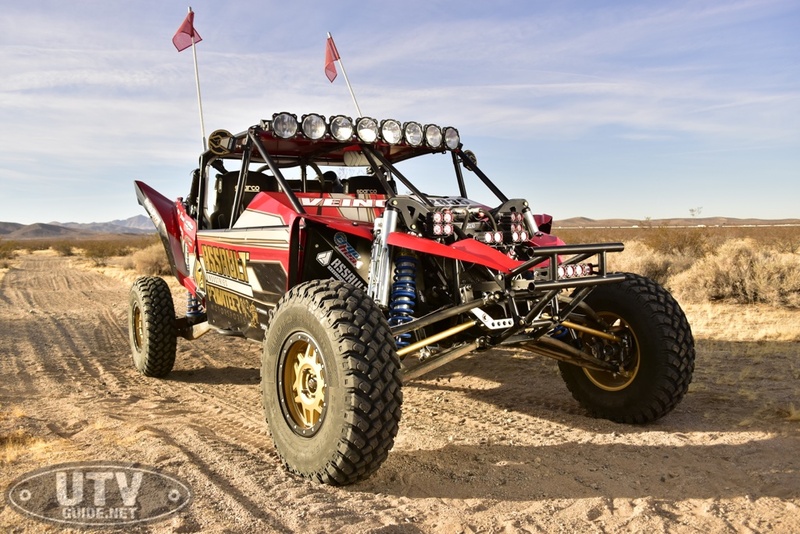 What isn’t common, however, is to come across one that is seemingly a hybrid between a Yamaha YXZ1000R and a Baja-developed, top-tier race truck. 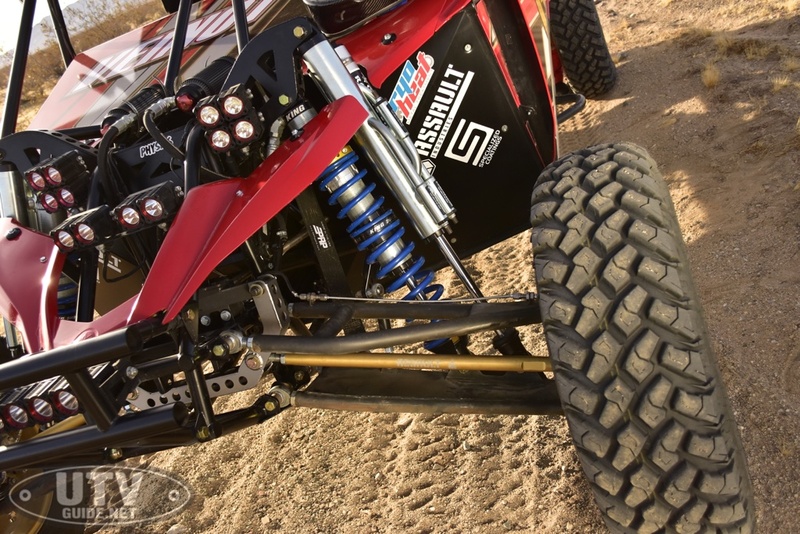 When all UTV manufacturers use an independent rear suspension setup for their sport machines, why would one team convert the entire car to a solid rear axle setup? 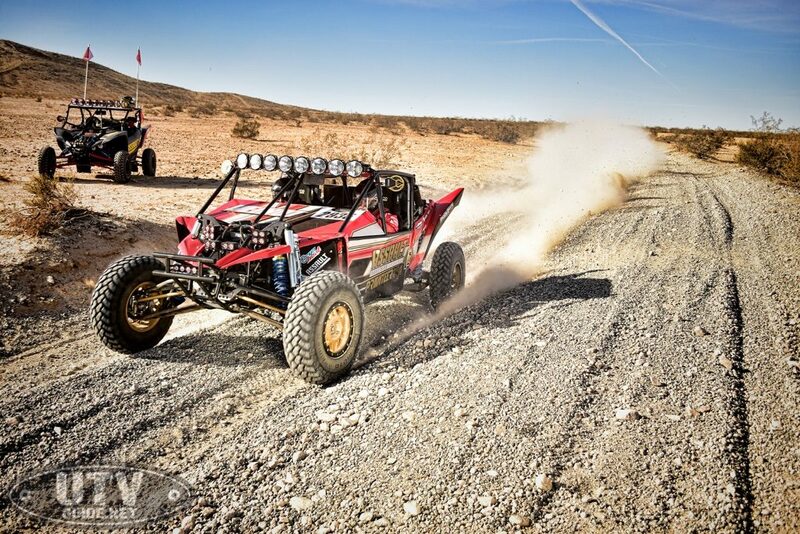 The rigors of desert racing put more stress on a race vehicle than any other form of competition on the planet. Not only do the cars have to deal with speeds of up to 100 mph in the dirt, but they have to do so over holes, bumps, and terrain changes large enough to swallow the entire car. 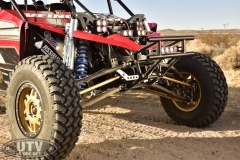 Independent rear suspensions have a lot of moving parts, the weakest of them being the CV joints and axles. Simplifying the entire setup and running more robust parts is a great way to decrease your chances of a DNF on race day. The conversion, however, is not so simple. In fact, this one required a complete re-working of the vehicle’s frame, which is how this once-stock Yamaha YXZ1000R has been transformed into one of the wildest race machines we have ever laid our eyes (and hands) on. 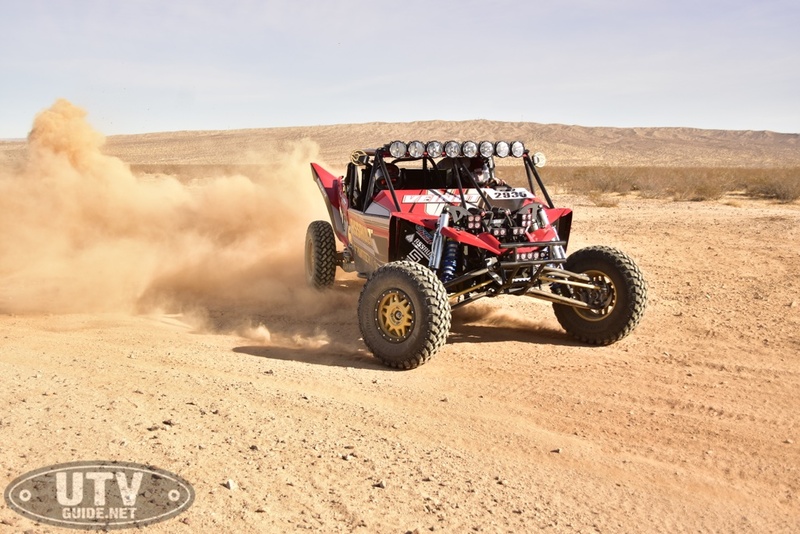 Ricky Veinot of Privateer Motorsports has been a long-time friend of Assault Industries owner Marcelo Danze, and they even built two custom YXZ1000R turbo vehicles to test product with and have some fun out in the silt and sand of Southern California. 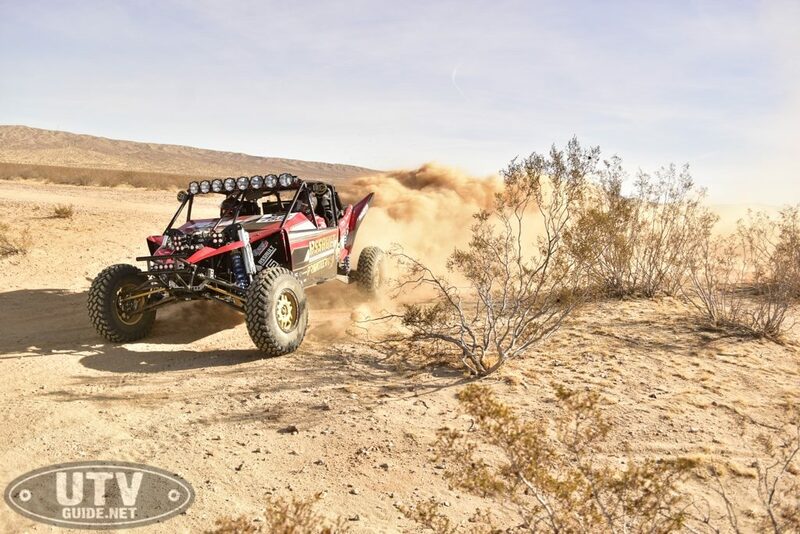 Those two turbocharged, built-motor machines run great, but they were starting to approach the limits of what the stock chassis and running gear could handle. Rick’s YXZari was not kind to rear CVs and axles, so Assault and Privateer teamed up to re-work the car from the frame up. Relying on Assault’s engineering expertise and Ricky’s fabrication skills, the team built the entire car using 3D modeling and stress analysis software to ensure that it wouldn’t be prone to failures on race day. 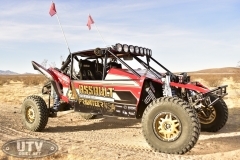 Assault’s design studio houses a Faro Arm, CMM, and computer-aided engineering tools, which was just what they needed to create this beast of a machine. Once the design process was complete, they used the drawings to replicate the real thing out of high-end materials. 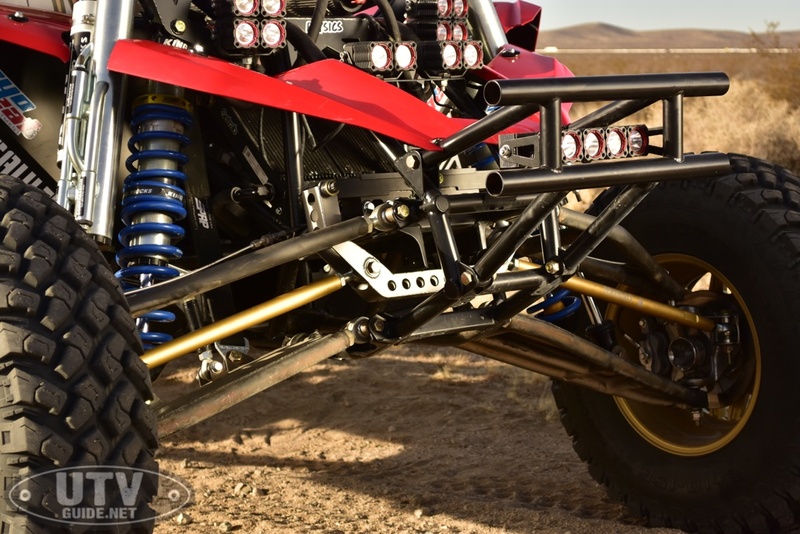 The tube chassis was built on a jig in Privateer’s shop, stretching the YXZ’s frame to accommodate a mammoth 125 inch wheelbase and an 80 inch track width. 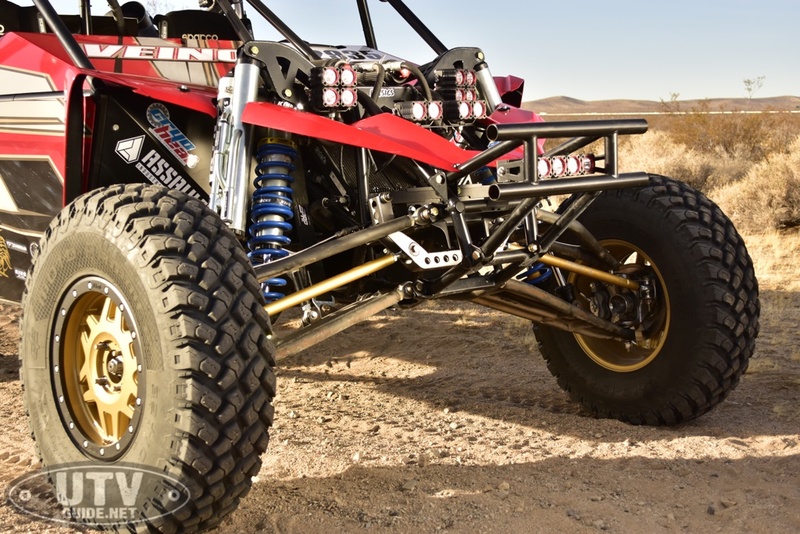 For a size comparison, a Can-Am Maverick X3 Max Turbo R is 10 inches longer in the wheelbase, but 8 inches narrower in track width. 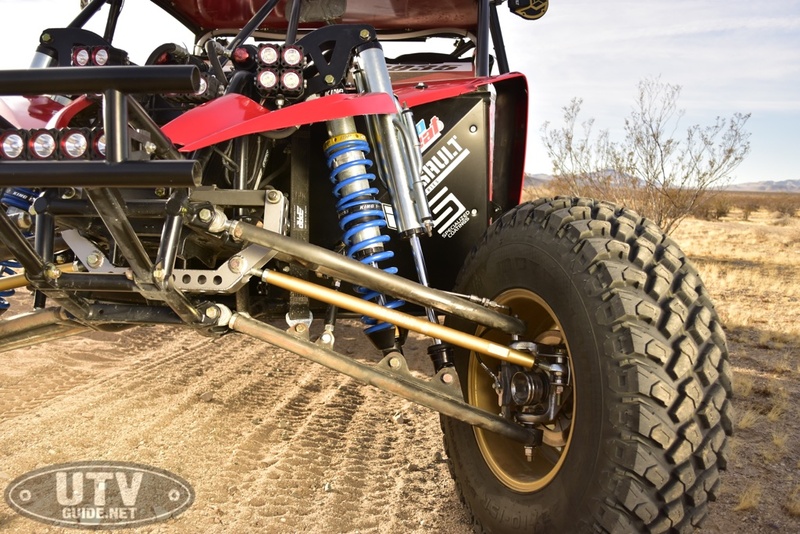 This size car was ideal to Assault and Privateer, as it allowed them to run the suspension they wanted while giving the car enough length to handle nasty terrain without bucking. 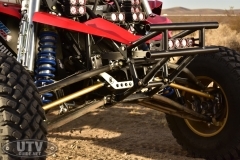 The front suspension uses the stock-location suspension pivots from the YXZ’s frame, which is a class rule for off-road racing. 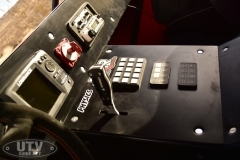 The arms, shock towers, and four corner bypass setups are all bespoke to this car. 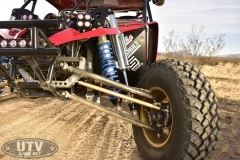 By running a coilover and a bypass at each corner, they are able to truly fine-tune the suspension’s reaction to terrain at each point in its travel. 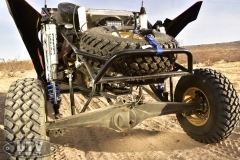 The front suspension is strapped at 21 inches of true wheel travel, while the rear triangulated 4-link system cycles 24 inches without worry of binding a CV joint. 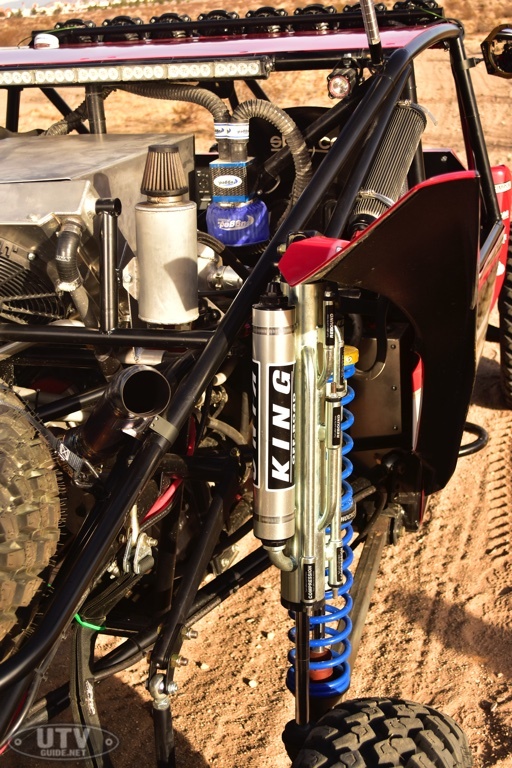 The King 2.5” front and 3.0” rear shocks and bypasses are true race-car parts, sourced from the same components King uses to build their high-end trophy truck shocks. 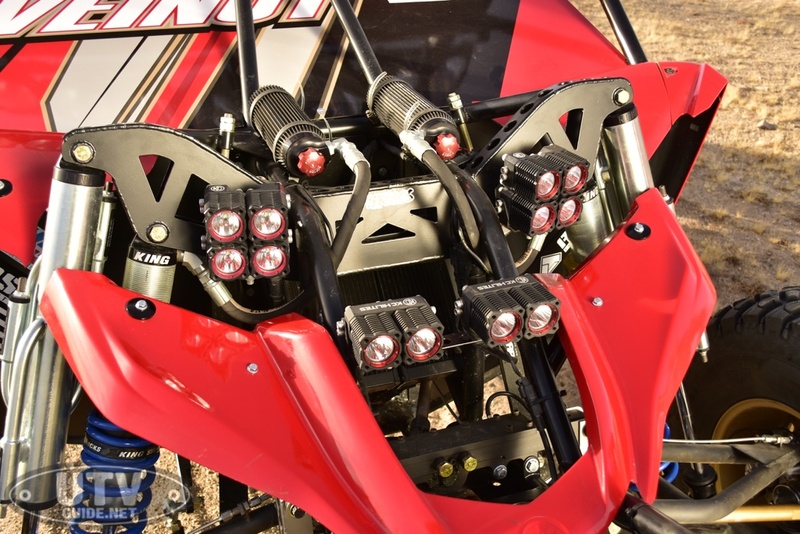 By removing the stock trailing A-arm design that the YXZ uses, Assault and Privateer were able to develop a suspension system that does not change track width or camber angle during compression and extension. They enlisted the help of Jason Montes, a well-known offroad chassis fabricator to make it happen. 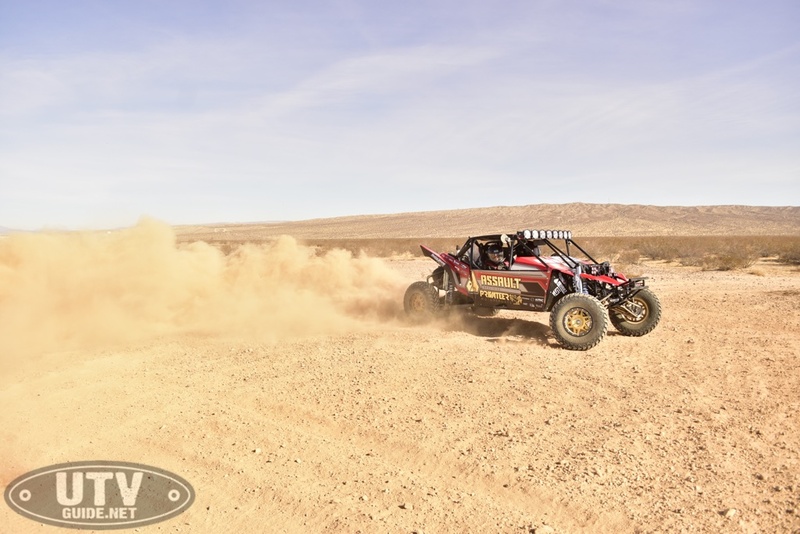 The rear of the car is the same width at every point in its travel, eliminating tire scrub and rear-end wandering during repeated pounding through whoops, ruts, and G-outs. 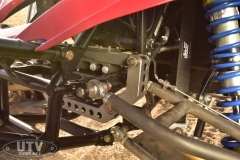 A rear suspension that doesn’t change width during compression greatly aids in the stability of the car as it rolls through uneven terrain. 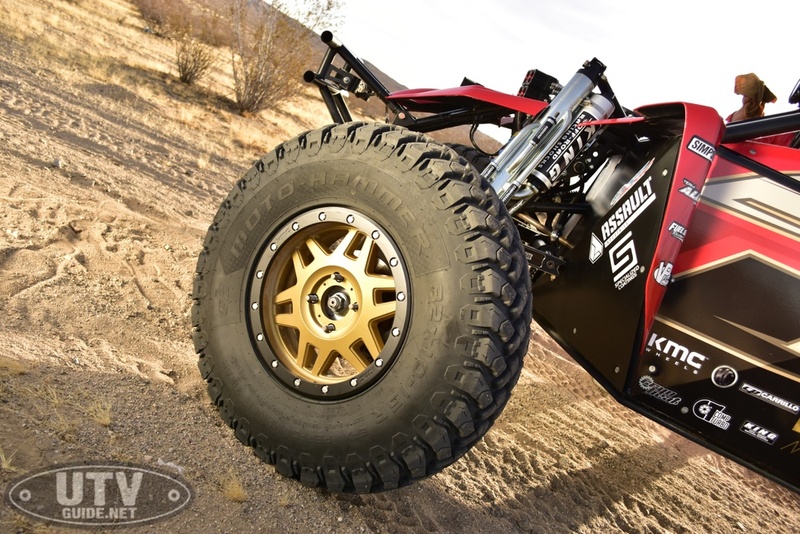 The rear end is an 8” Toyota solid axle, which means parts are readily available almost anywhere and can be built to handle more power than they could ever throw at it. 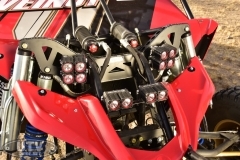 All of the suspension mounting points were optimized for durability, and the shock mounts were changed to achieve the desired motion ratio. The front shocks mount to the lower A-arm, which allows a longer shock to be fitted at the correct vertical angle, placing less leverage on the mounting points than a shorter, laid-down shock mounted to the upper arm would encourage. Designing a suspension system to work properly during hard trail riding is tricky enough, let alone designing one to hold up to 400 plus miles of flat-out driving through the desert in a single race. 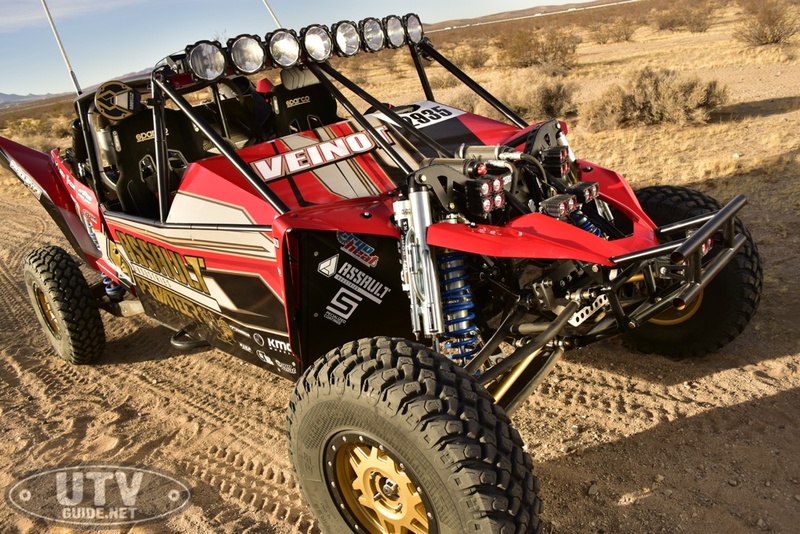 The motor was built when it resided in the stock YXZ chassis, and features some very high-end racing parts. 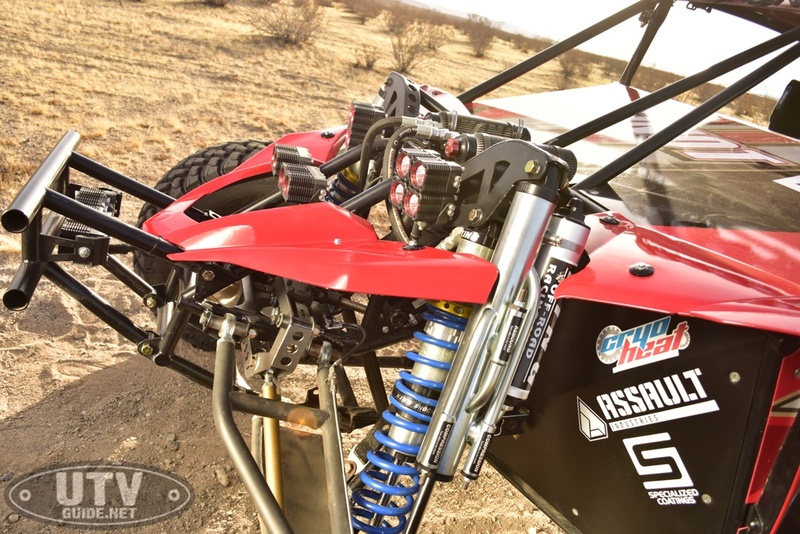 Privateer Motorsports built the engine in-house using custom CP pistons, Carillo coated rods, custom head porting, Crower cams, upgraded valve springs and retainers, an Alba timing chain tensioner, an Alba lightened flywheel, and a custom turbocharger kit. All of the engine’s internals were sent out for cryo treatment and micro polishing by Cryoheat for added strength. The custom turbo kit breathes through a Burns stainless steel collector and custom exhaust manifold. The oilless turbocharger uses a stainless steel turbine housing and high-tech internals. The exhaust and waste gate dump were built with Ticon Industries titanium tubing, and it was pie-cut for a factory race look. A custom CBR radiator and hand-made intercooler allow this engine to lay down 350 crank horsepower on race fuel. To handle the added power, the YXZ’s transmission was sent out to Cryoheat for cryo treating and micro polishing. The clutch was replaced with a beefier Barnett clutch and spring conversion kit to hold the power. 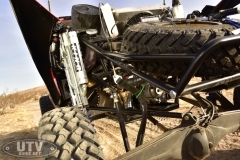 Tube Works’ clutch oil modification was also performed to keep the assembly lubricated, and it has a separate transmission cooler to keep temperatures under control. 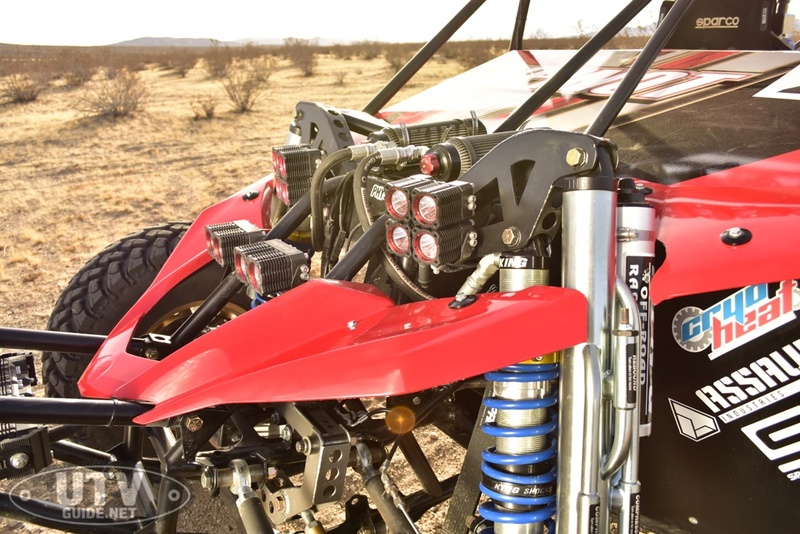 A custom oil cooler and one gallon external oil tank are used to keep the engine full of clean, cool oil. 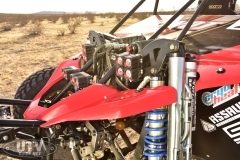 A custom catch-can design keeps the engine from ingesting oil blowby when it’s running hard. 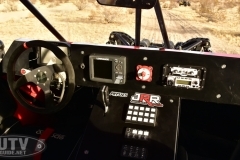 The engine is controlled by a standalone Motec system designed by John Reed Racing, complete with launch control and on-the-fly boost level adjustability. There was no expense spared with the engine and drivetrain in this vehicle, and depending on the gearset they run in the Toyota 8” rear end, the car is good for well over 110 mph. 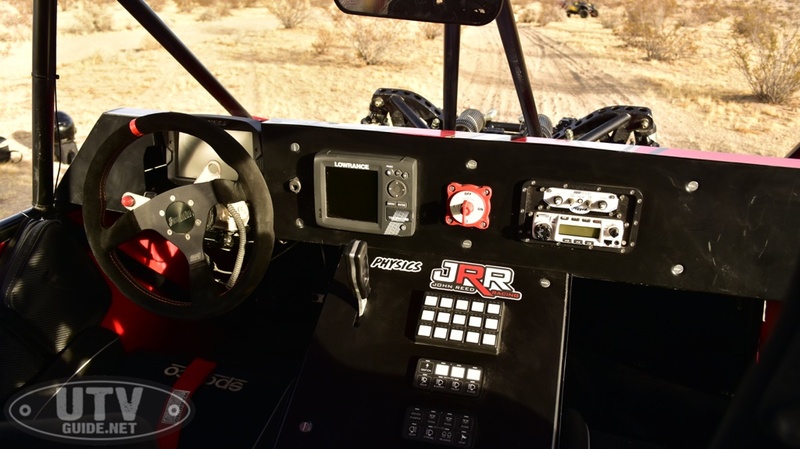 The interior of the car received the race treatment as well, using a widened cab with a full sheet aluminum dash and center console to hold the AEM CD7 digital display, gauges, switches, and Switch Pros keypads. 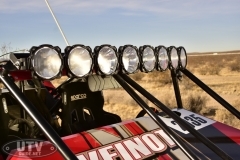 Lighting is handled by KC, with an array of Pro 6 LED, Flex LED, and Cyclone LED lights positioned in key places to aid in forward visibility and provide lighting in the event of a trailside repair. 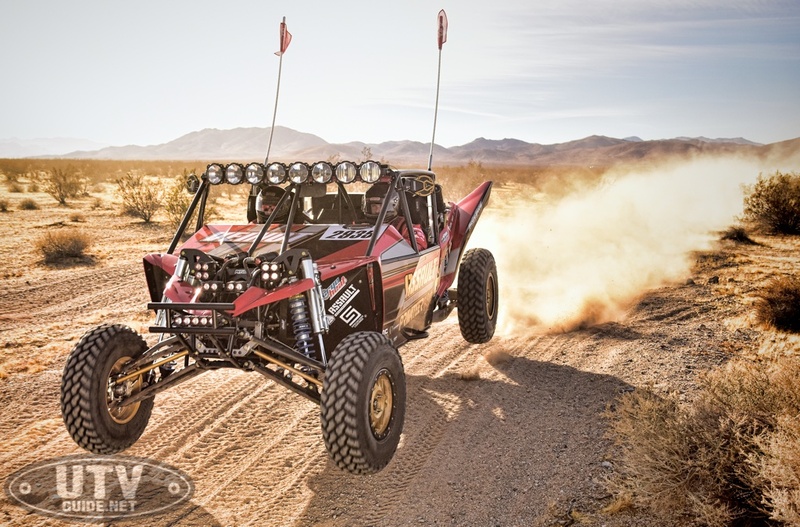 Full race weight for the YXZ comes in at 2,127 lbs full of fluids, with spare parts, tools, and tire on board. The steering rack has been replaced with a Howe racing manual rack, but retains the stock YXZ electric assist. A steering ratio quickener has been fitted as well, reducing the amount of wheel movement lock to lock. 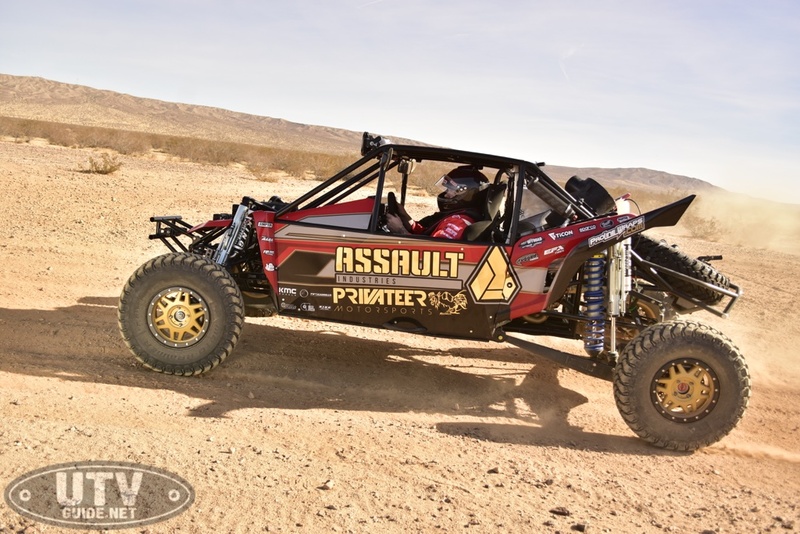 We met up with the Assault and Privateer guys out in Barstow for a short test session and photoshoot to get some time with the car. It’s a sight to behold in person, with incredible attention to detail and build quality. Every piece of the car has been designed to serve a purpose. 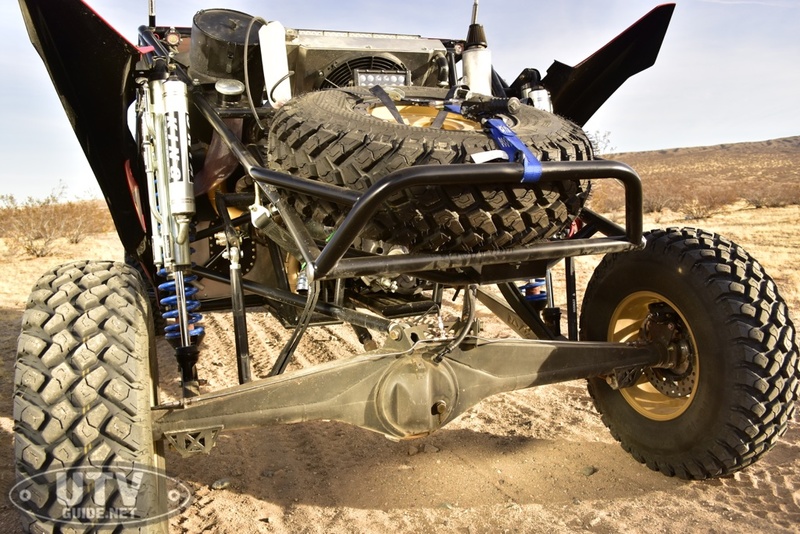 Removing the spare tire from the rear rack grants easy access to the powertrain and rear end, making trailside repairs fairly easy. 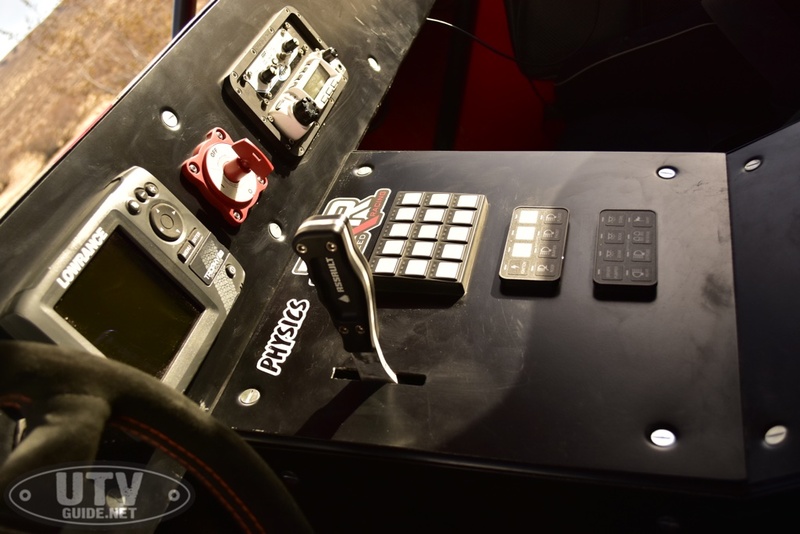 The widened cab is much more comfortable for larger passengers, and all of the switch gear is within easy reach of the driver and passenger. 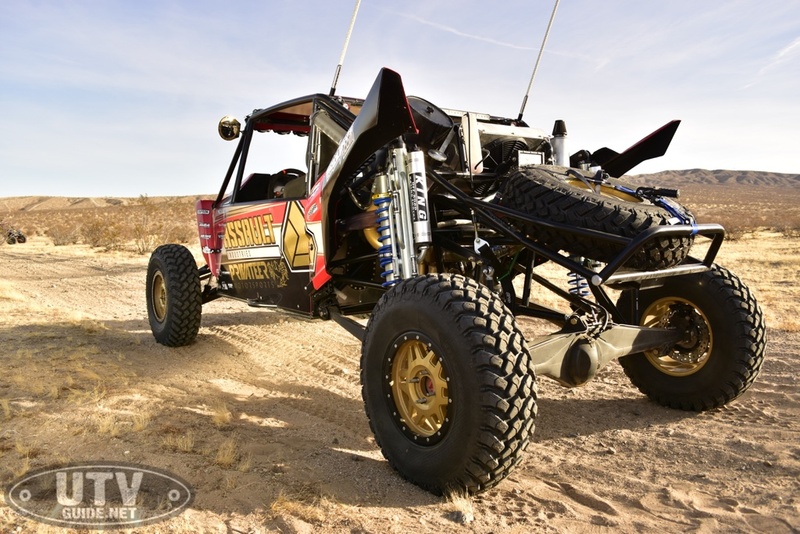 The way this car eats up desert terrain is awe-inspiring. 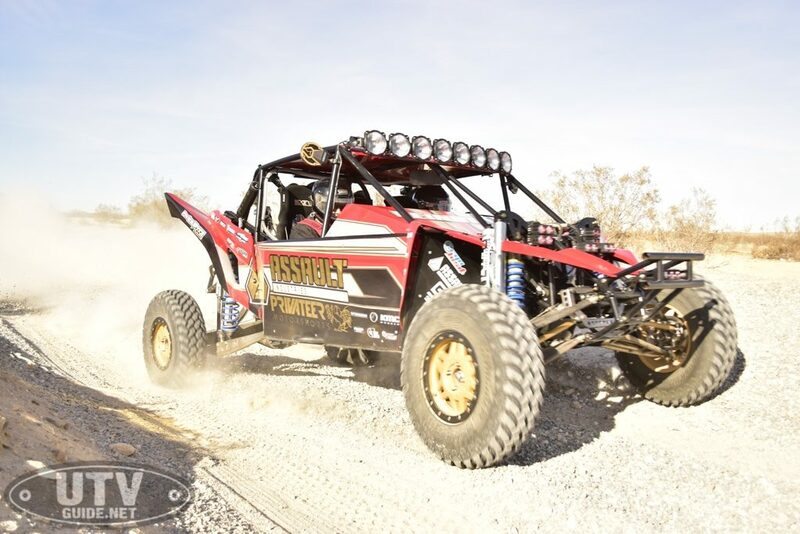 The solid axle rear end floats through huge whoops and G-outs, keeping the car straight and level as the 350 horsepower turbo inline 3 cylinder engine sprays a huge roost behind the car. 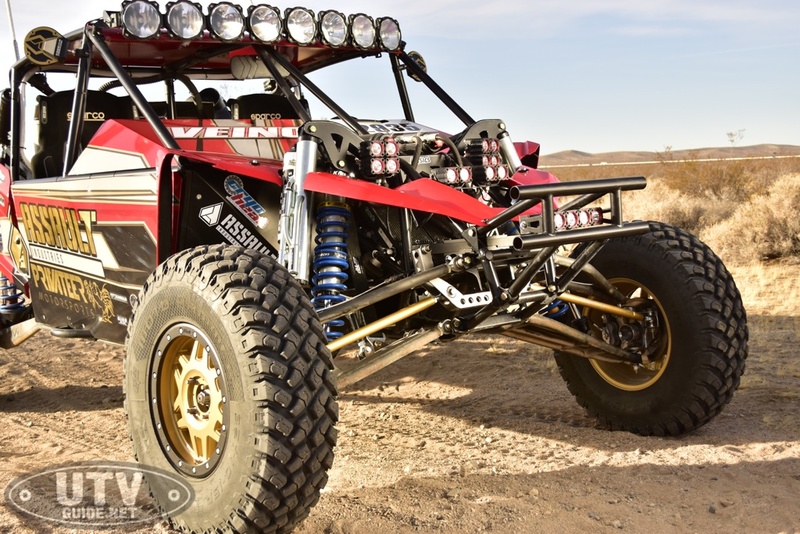 The YXZ has been converted to run rear wheel drive only, allowing Privateer to drop another hundred pounds or so worth of rotating drivetrain mass from the car. 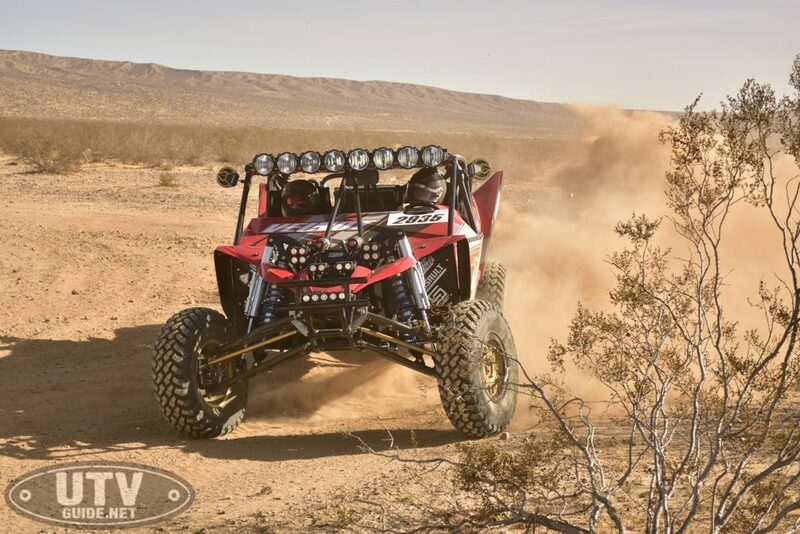 The sound the YXZ makes at full tilt under boost is intoxicating, sounding much more like a hopped-up exotic sports car than a UTV. During our testing, the car never experienced even a hiccup. It did suffer a bent rear brake rotor from an unplanned contact with a rock, which only caused an annoying brake squeal. The way the solid axle rear end is laid out is relatively simple, and hugely strong. 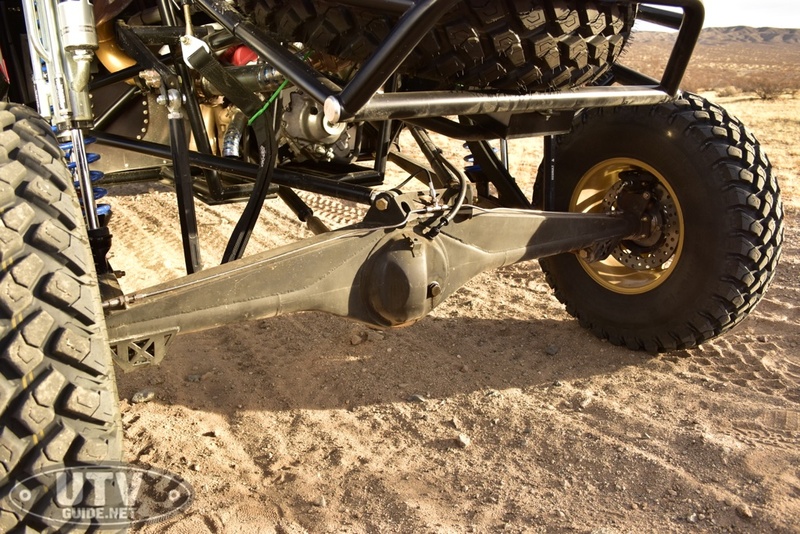 A billet carrier bearing supports the front end of the drive shaft as it exits the frame’s center tunnel, and it features a long enough drive shaft to support 24 inches of wheel travel without binding. 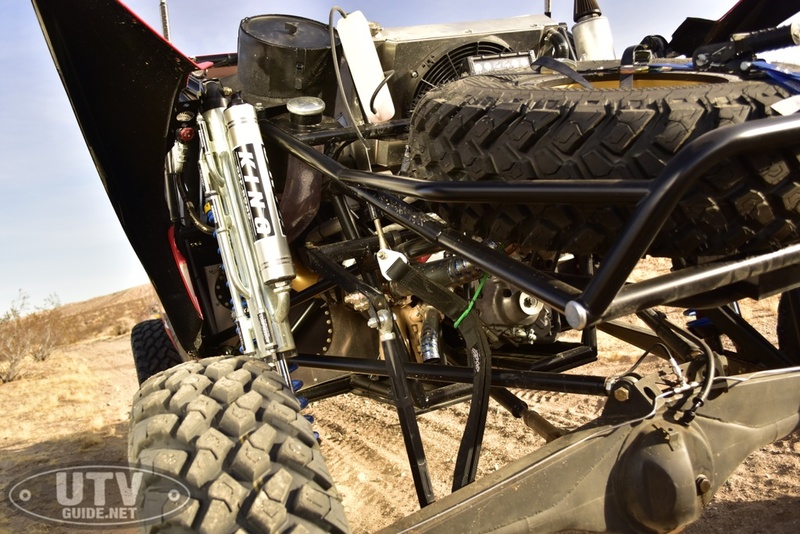 Being able to find replacement parts for your rear end in any automotive parts store, junk yard, or online site is an added benefit- the Toyota 8” rear end in this YXZ is one of the most common solid-axle setups on the planet. Assault and Privateer are working on moving into a 25,000 square-foot building that will act as a race shop where they plan to build custom cars, cages, and more. In the future, you can expect the partnership of these two brands to pump out turn-key race cars, rolling chassis, and much more. When asked how much this car cost to prototype and build, the answer we got was a fuzzy “North of 100k”. In the future, they plan to offer this same setup as a rolling chassis or complete race car for well under the $100k mark. Keep an eye out for this car during the 2018 BITD and local Southern California/Nevada race seasons, as we expect it to make quite a splash!